Yep. I messed up. I accidentally fed my family gluten this week. We were only supposed to add soy back in this week, not gluten. Here’s what happened… I usually buy the Trader Joe’s tempeh and completely forgot that it contains barley, which has gluten. Guess what we had on Monday night – tempeh spaghetti. And guess who didn’t feel well on Tuesday? Allan. Well, I guess we now have a good idea what has been causing Allan’s digestive problems. Here is something that I managed to not mess up – roasted gourd seeds. When we went to the pumpkin patch two weeks ago we picked up several squash, so we have been eating a ton of squash. Instead of composting the seeds, I have been roasting them. 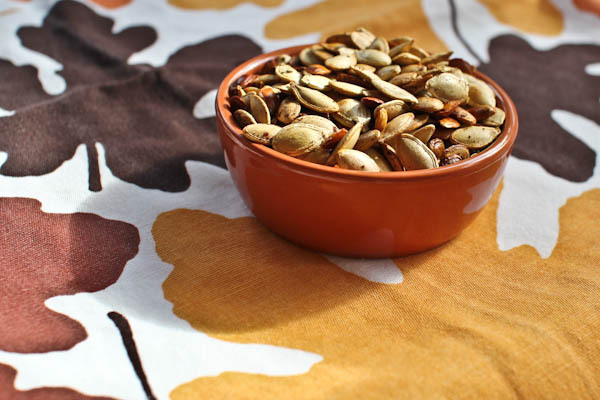 Roasting your pumpkin and squash seeds is very easy. To prep the seeds for roasting start by separating the strings and the seeds. Compost the strings and rinse the seeds. I usually place my seeds in a shallow bowl of water and let them sit for a couple minutes. This helps to loosen the strings and debris from the seeds. Drain and rinse the seeds. After the seeds are cleaned, dry them thoroughly. Now they are ready to roast. 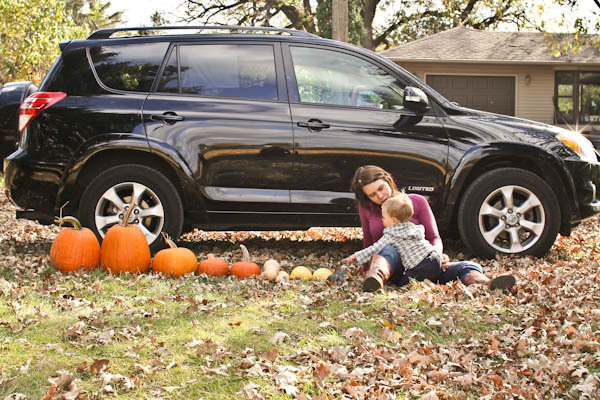 The perfect fall treat. 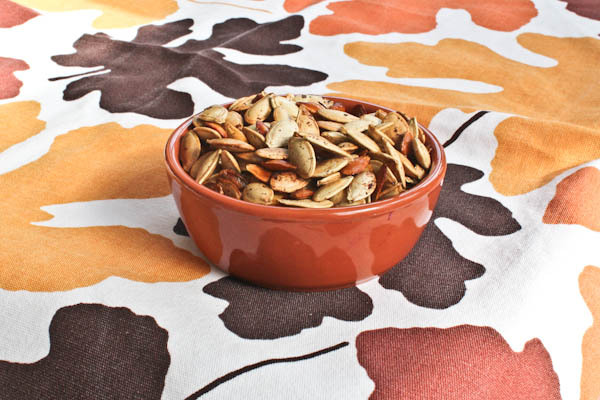 Snuggle up with your loved ones, a bowl of roasted seeds and It’s The Great Pumpkin Charlie Brown. Preheat oven to 400°. Spray a baking sheet with oil. 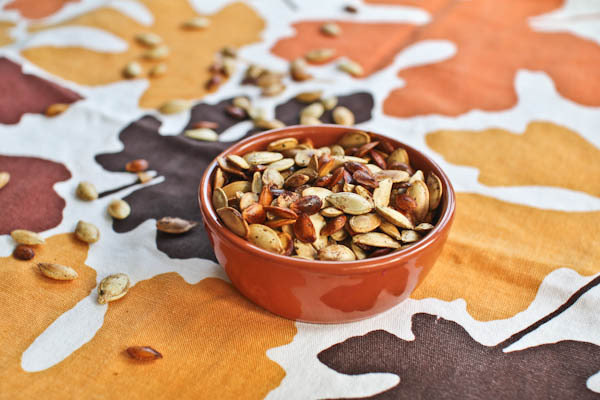 In a medium bowl toss together all ingredients until seeds are well coated with oil and seasonings. Pour seeds onto prepared baking sheet and spread out into one layer. Bake 20-40 minutes, stirring every 10 minutes until seeds begin to brown, but not burn. Roasting time with vary depending on the type and size of seeds used. Store in an airtight container for 1-2 weeks. Thanks! 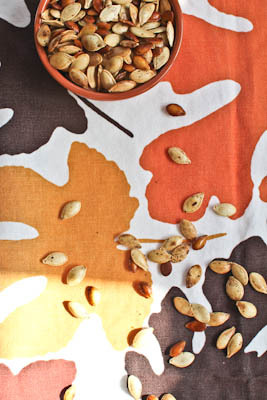 I love roasted butternut squash seeds, they are less fibrous than pumpkin seeds.